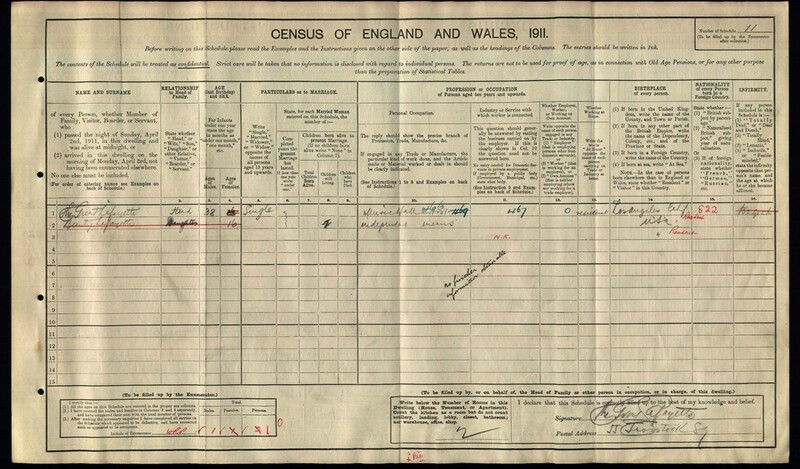 The 1911 census of England and Wales was taken on 2nd April and recorded the details of over 36.3 million men, women and children. The count included all individual households, plus institutions such as prisons, workhouses, naval vessels and merchant vessels. The census also included records for the Channel Islands, the Isle of Man, Royal Navy ships at sea, and overseas military establishments. 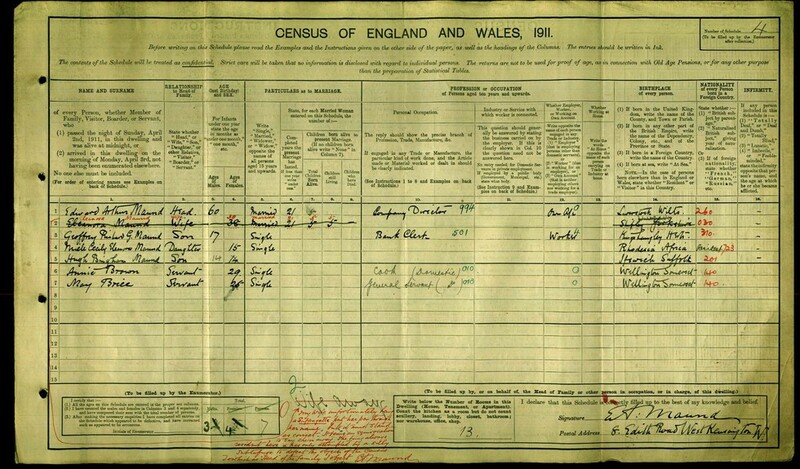 The census is perhaps one of the most valuable resources available to UK family historians and can reveal a whole host of essential information for building your family tree. Beyond that, census records occasionally offer a glimpse into your ancestors' personalities, interests, and even sense of humour. 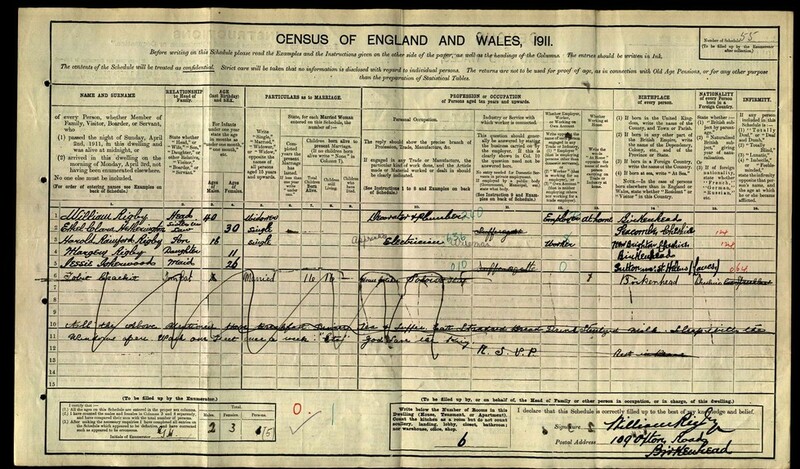 The 1911 census was the first for which householders' original completed schedules were retained. This means that when viewing an original census form, you're actually looking at the information your ancestor entered on the night of the 2nd in their own handwriting. It's not unusual to come across unusual and often amusing entries, as these handwritten forms often reveal personal comments, mistakes, anecdotes and sketches omitted from summaries by official census enumerators. Britain is often described as a nation of animal lovers and our obsession with our pets is by no means a modern phenomenon. Trawling the 1911 census, you may come across someone whose name, age and occupation sound rather suspect. This could be because they were actually a household dog or cat listed as a member of the family. Mr. Little goes on to describe Roger as being five years old and having been born in, 'Keighley, Yorkshire'. His occupation is listed as a, 'watchdog', 'employed on own account', and his industry is listed as, 'looking after house'. Roger appears to have been of good breeding; in the section of the census form dedicated to listing an individual's children, James wrote '?, but something over a 100'. Dogs weren't the only creatures our Edwardian ancestors viewed as part of the family. 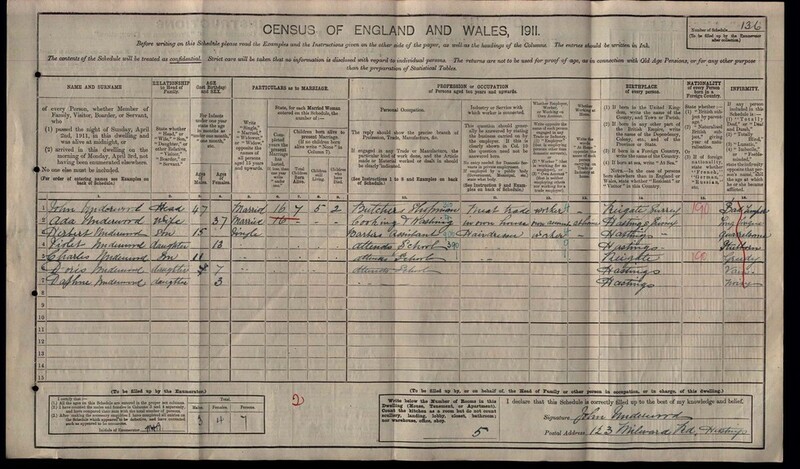 The Rigby family of Upton Road, Birkenhead included their cat Tom in their census form. 'Tom Cat' was listed as being an 8-year old, married Mouse-Catcher, Soloist and Thief with 16 children. His birthplace was listed as Cheshire and he was described as being 'speechless' in the infirmity section of the form. The head of the household, William Rigby, obviously had a sense of humour as underneath he wrote, 'All the above mentioned have Breakfast, Dinner, Tea and Supper. Eat Standard bread Drink sterilised milk. Sleep with the windows open. Wash our Feet once a week etc. God Save the King RSVP". This, along, with Tom's details, was crossed out by an annoyed enumerator. 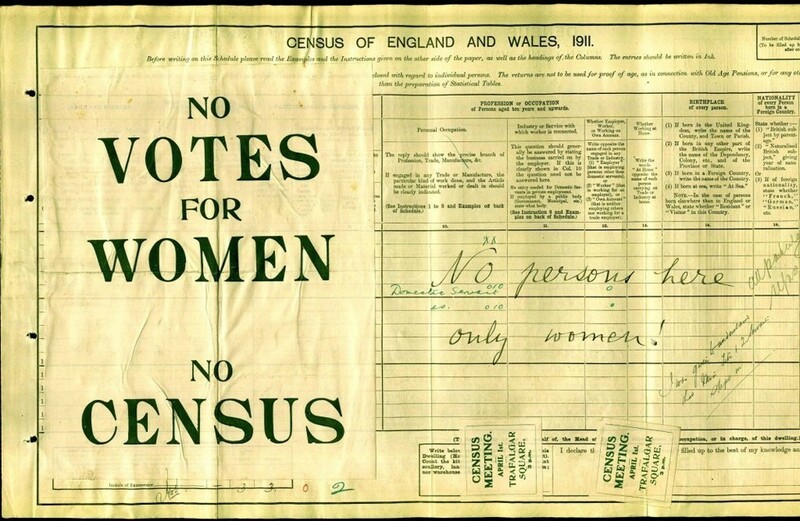 Still battling towards their goal of universal suffrage, tens of thousands of women decided to boycott the 1911 census by resisting being counted in protest. Many women hid and attempted to confuse enumerators by travelling to different addresses throughout the night, while others opted for a more creative approach. 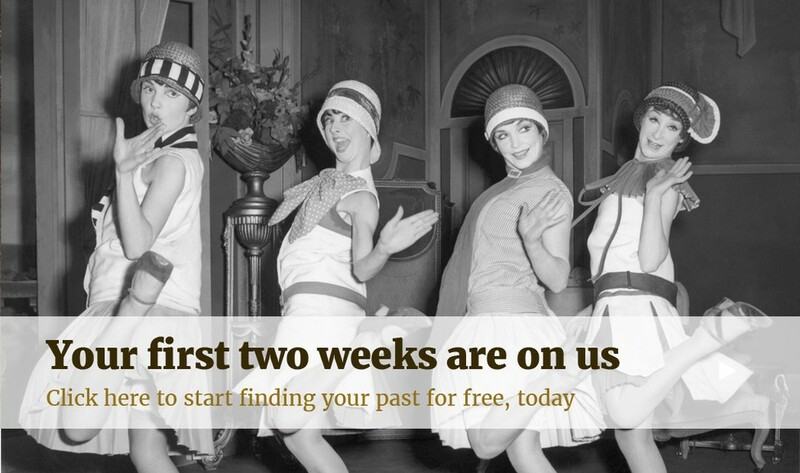 The Women's Freedom League launched a campaign inspired by Gandhi's principle of passive resistance encouraging women from all over the UK to return their forms 'spoilt'. Their supporters filled in forms, not with their details but with slogans such as, 'I don't count so I won't be counted'. When searching the 1911 census, you may occasionally come across examples of these protests. Ranging from sarcastic quips to serious political statements. In the example above, the form has been returned blank and in place of household details, a large 'Votes for Women' flyer has been stuck. To add extra insult, stamps advertising a 'census meeting' the previous evening have been stuck on along with the handwritten slogan 'no persons here, only women'. You can also see the enumerator's attempt to complete the form written in green ink. Some husbands, however, did not support their wives' political beliefs or attempts to boycott the census. At the bottom of the form, in red ink, you can see Company Director Arthur Edward Maund's attempt at correcting his wife's attempted sabotage. 'Unfortunately, my wife being a suffragette put her pen through her name,' he writes. 'A silly suffragette to defeat the object of the census, to which as head of the household I object'. Someone probably spent the night on the sofa! Our final example of suffragette protest takes on a more sombre tone. A Miss Kate Gillie dedicated her protest, 'in loving memory of Mrs Clarke and Miss Henria Williams who lost their lives for the cause'. Black Friday occurred on 18 November, 1910, and was the first recorded incidence of police force used against a suffragette protest. She cites Churchill's reluctance to investigate the matter as a cause for further inspiration and declares, 'if I am intelligent enough to fill in this census form, I can surely make an x on a ballot form'. She defiantly signs off by declaring her home a, 'house full of evaders'. 6. A House Full of Hypochondriacs? The census also recorded illnesses and infirmities. The column, which details descriptions of people's ailments as perceived by the head of the household, contains information given for the most part by people who would have had no medical knowledge. Therefore, plenty of amusing and unusual health conditions were recorded. One record, written by John Underwood from Hastings, East Sussex, describes his children as, 'quarrelsome', 'stubborn', 'greedy', 'vain' and 'noisy' while he records himself as 'bad-tempered' and his wife as suffering from a 'long tongue'. What a barrel of laughs he comes across as! The celebrated illusionist, The Great Lafayette, took a similarly relaxed approach to completing his census form. Lafayette listed his infirmity as 'too good' and recorded his beloved pet dog, Beauty, as being his 16-year-old daughter of independent means, which is either incredibly sweet, or astoundingly weird. You decide. 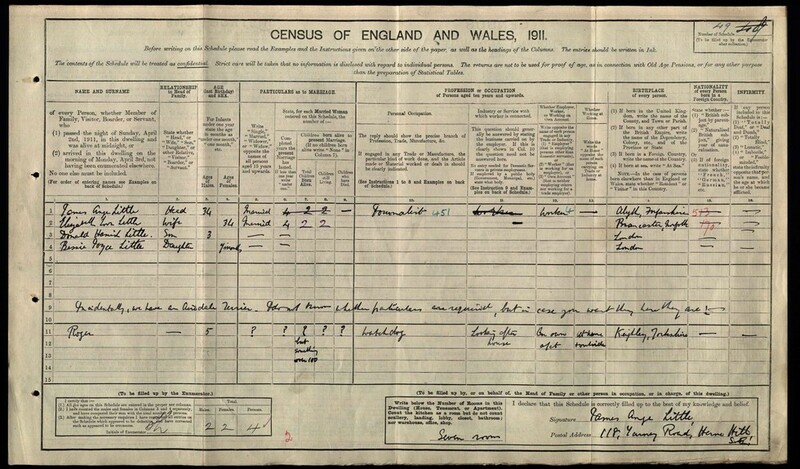 These census entries give us a sense of post-Edwardian humour, society and family dynamics, proving what we've been saying for years: the 1911 census is one of the most illuminating and entertaining documents in UK family history.